Can you believe this year is almost over? My favorite holiday is Christmas so I naturally have more Christmas decor than any other holiday. I’ve teamed up with some talented Instagram buds to bring you a fun blog hop! 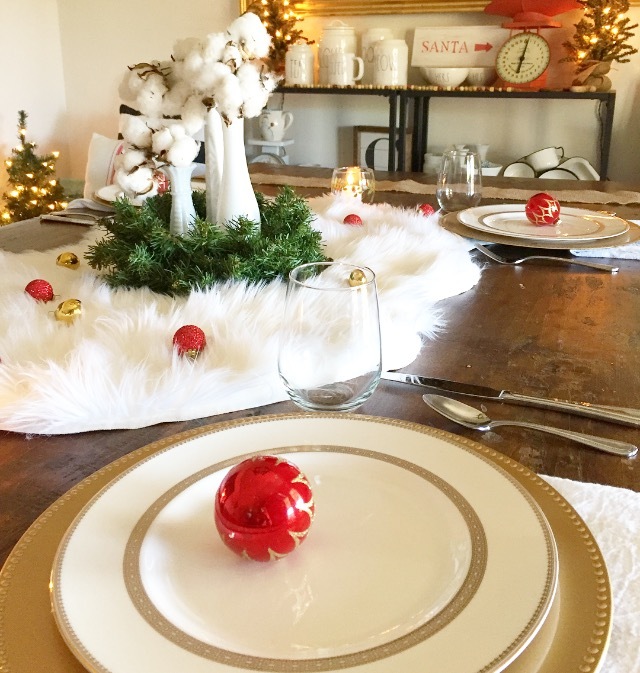 It’s all about Christmas tablescapes and I’m so excited to share mine with you guys! Links to the other ladies blogs are attached at the bottom! 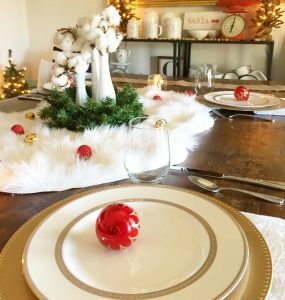 I literally used dollar tree items mainly for this Tablescape! My chargers and candle holders are from dollar tree! I also pulled from my decor in other rooms as well. 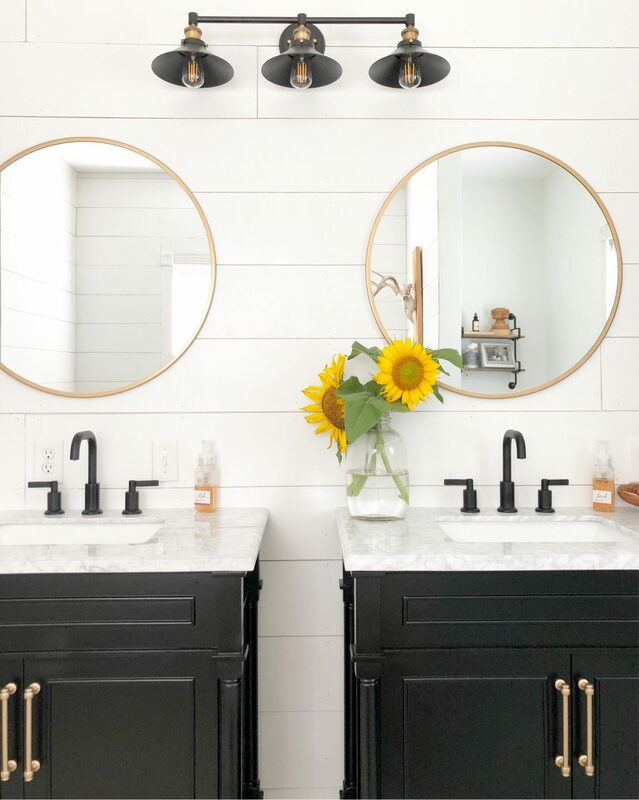 I want to keep my decor simple this year in each space. Simplicity is what I kept in mind as I was styling my Tablescape. I used flour sacks for napkins & yes, that’s a rug for a centerpiece. 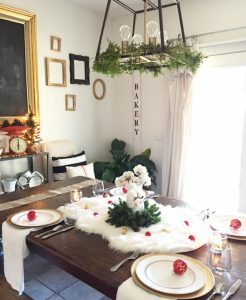 I used a wreath around a few vases, put a little cotton in vintage milk glass to make the centerpiece. I cut fresh cedar from my parents yard to dress up the light fixture. Heather, this is so beautiful! 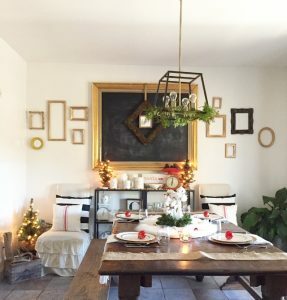 I love that it is simple yet still so festive. And how special that those were your Grandmother’s ornaments. 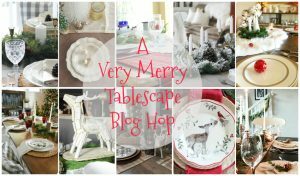 So happy your joined our blog hop! Love your table friend. it all looks so festive and cozy. Loved getting to blog hop with you. Heather I love your table! It is simply elegant and your grandmother’s ornaments are the perfect touch! I love using Dollar Store items too! And that rug idea is brilliant! I love your out of the box thinking. So glad we were able to do another blog hop together!! So sweet, Heather! 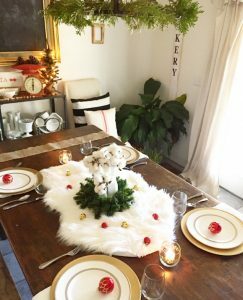 The rug gives it such a cozy and wintery feel and I adore the vintage ornaments!